In Her Own Words – How One Woman Felt Before and After Her Boudoir Session. If you’ve ever thought about booking a boudoir photography shoot but have changed your mind at the last minute, then read on to see how one woman felt before and after her session. And if you’d like answers to all those questions about what a boudoir shoot is like and how to prepare, then simply claim your free copy of my boudoir e-guide here. At our pre-session meeting Ginny told me how she’s always been busy caring for her family and has had no time to really focus on herself. So Sophia and I treated her to a pampering morning at Guildford’s Mandolay Hotel, and here are some of the behind-the-scenes shots, together with my favourites from the session. If you scroll to the bottom you can also read Ginny’s reaction to seeing her photographs, which completely bowled me over. 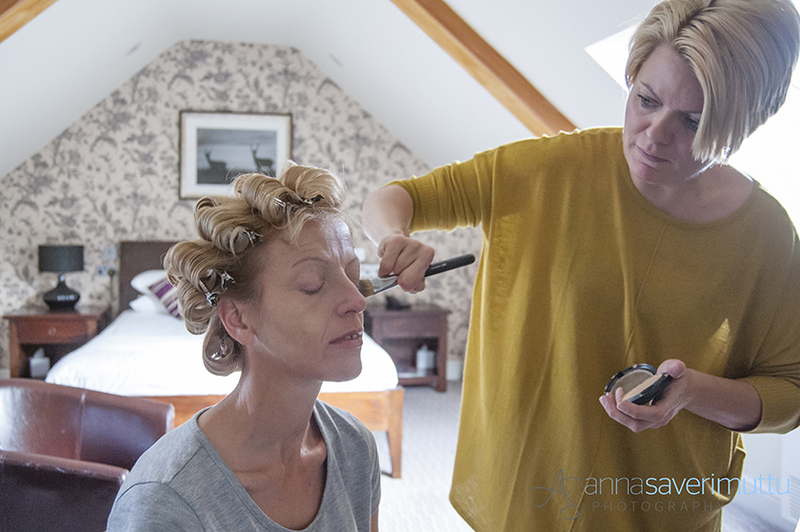 Sophia does Ginny’s hair and makeup in our lovely room at the Mandolay Hotel. Adding the final touches, with some fabulous, vintage-style fake lashes. Looking stunning with beautiful hair and makeup. “Always the last to agree to photos if I actually have to be in them, I told my husband and best friend what I had done and got complete nerves on the day about whether to go or not. I did, and it was the best choice I ever made. Only the makeup artist and Anna were in the room which made me feel comfortable. Yes, I was still nervous when it was time to change, but you have your own bathroom and Anna is on hand to help with the choice of outfits. The day flew by and every step of the way Anna guides you through each photo. I came out feeling a different person and almost proud of what I had achieved that day. When I saw them I almost couldn’t believe it was me – I was so choked up by the result of them. They prove that even women with little figures can be nervous of how they look and just don’t realise how beautiful they really are. I have 4 children and it took me out of the world of just being a mum and for once let me be me again – the confident woman I was years ago. Every time I question myself and look at my photo I think to myself that I did that and can do anything. I am so proud of it. What Anna achieved that day was bringing a mum of 4 and a wife back to life and making her feel the way she deserved to feel. Although my husband was shocked at me doing the shoot he loves the picture, and something that really made it special to me was when I finally had the guts to tell my mum and showed it to her. The opinion I got was totally different to what I expected because all she saw was how beautiful her daughter was and she was so proud that I hadn’t backed out of it.